← Tula Tuesday, Finally… and Almost Finally. Ooh, the quilting is gorgeous! Hooray on getting this one finished! Now that you’ve seen this one quilted, do you think you’ll send out yours when you finish the top? Yay, for a finished quilt! If they’re bigger than lap size I have to send them off. I’m glad your mom loves it. Quilts are never late… right? Love it! It’s so pretty and your mom looks so happy. Win, win! It’s lovely Sam. Quilts make the best gifts. The quilting sets it off beautifully. You can see how thrilled your mum is with it! happy dancing here for you and your mom! it turned out gorgeous! and how sweet that she wants to enjoy it where she spends most of her time. way to go Sam! looking forward to what you decide with your version now. 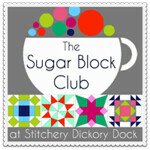 I’m thinking I will make another full set of 12 blocks for mine, to make a bigger finished product… stay tuned! That quilt turned out really well. Your mom looks absolutely thrilled with it!